Borderlinx | Buy Hollister and ship worldwide with Borderlinx. Cheap rates guaranteed. Do you dream of a So Cal summer all year round? Cut-off shorts, sunny T's, flip flops and shades - Hollister USA dresses you up from head to toe for the summer of a lifetime. A subsidiary of Abercrombie &amp; Fitch founded in July 2000, Hollister USA is one of teens' most preferred clothing brands. Hollister USA brings the sun into your wardrobe with its comfortable, trendy apparel for those who just want to feel comfortable and look cool. So let the sun follow you all year round in Hollister USA's trendy styles. Hollister USA dresses up Dudes and Bettys in their favorite looks. Dresses and rompers or shorts and tank tops for Bettys, graphic T-shirts, henleys and hoodies for Dudes. Ready to hit the waves? Hollister USA Swimwear has got the perfect suit for under $75! Check out Hollister USA Jeans for the cooler days; choose from ton of cuts and washes that give you the hottest fit and a lived-in feel. For that summer scent, choose from a variety of perfumes from Hollister USA Fragrance collections for dudes and bettys. Hollister Fragrances are under $50! So, is the sun out yet? 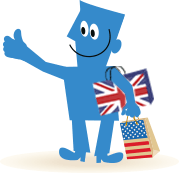 Now with Borderlinx you can buy Hollister in the USA and opt for cheap international shipping to your home country! Avoid any unexpected fees by paying international shipping, tax &amp; duties upfront, which you can calculate using our shipping cost calculator. A number of services are available through to make international ordering from Hollister USA hassle-free, including concierge, free repacking, and consolidation.